I'm someone who loves a good print and if I see a print I like from a designer I'll try to get it in whatever form I can. (It's a strange addiction to have!) 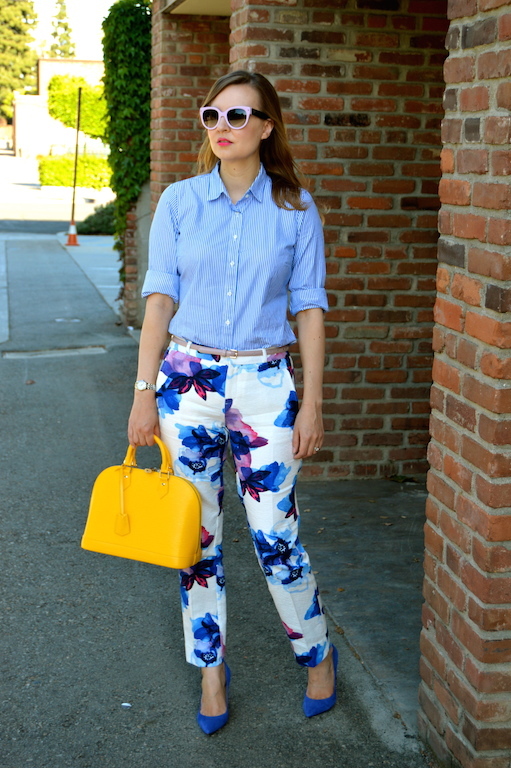 This was the case with this watercolor floral print from Banana Republic. Initially, I tried the skirt version of this print, but I put it back, rationalizing that my closet is utterly saturated with floral print skirts. I was still, however, obsessed with the print! On my next visit to Banana Republic, I spied these "Ryan" pants with the same print, so I thought I would give them a try. Normally I dread trying on and finding pants because they never seem to fit me just right, but these fit like a dream and I think I will definitely be pursuing their Ryan fit pants in the future. When I brought my pants home and showed them to my husband he wasn't as concerned with the fit as he was with the pattern. All he could say was, "Now, those are some loud pants!" Indeed they are! I love that BR floral print, too! The pants look great on you, and I love that you paired them with the striped shirt. Fabulous bag, too! I could not resist this print either, I end up getting it in the top. I love how you styled these pants. Love this statement pants and how you mixed pattern with the pinstriped top! And your sunnies too, so so gorgeous! Ooh those ARE great pants, and I love them with the striped oxford shirt. I have a hard time finding pants that fit well too, so I may have to try this style from BR. Loud, proud and utterly irresistable! I mean they are in cobalt blue and purple - you had to have them! And I love that you've paired them with a pinstripe shirt; great idea. Love the print of those pants! Perfect styling! Also loving your sunnies! I am definitely a fan of patterned bottoms. Great look! Love the bold print on these pants, looks so fresh for spring! I love these!! 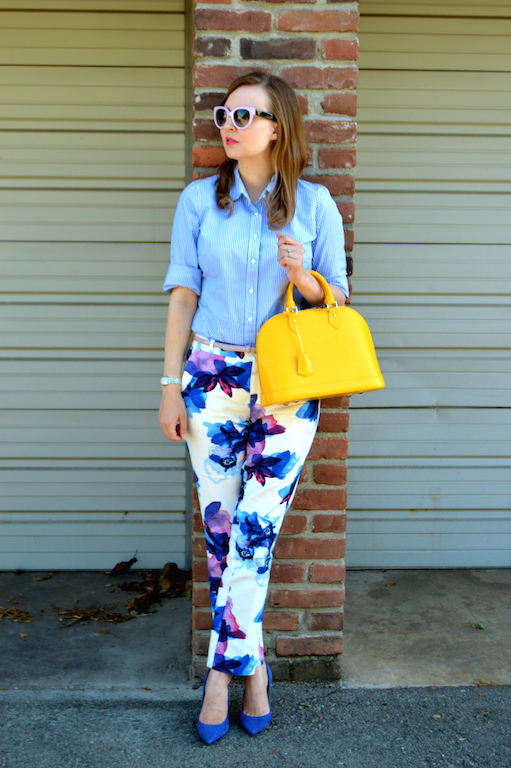 Gorgeous print Katie and your whole look is fab!